Article: Russell Wilson Set To Host The 2017 Nickelodeon Kids’ Choice Sports PLUS Find Out The Nominees At This Year’s Award Show! He’s brought extra sports-filled fun, a ton of excitement, and a whole lot of slime not just once, but twice as the host of Nickelodeon’s phenomenal and incredible, sports-inspired award show, the Kids’ Choice Sports, and now the one and only, iconic Seattle Seahawks quarterback, Russell Wilson will be making his way on over to UCLA’s Pauley Pavilion to host the stupendous 2017 Nickelodeon Kids’ Choice Sports for the third year in a row. 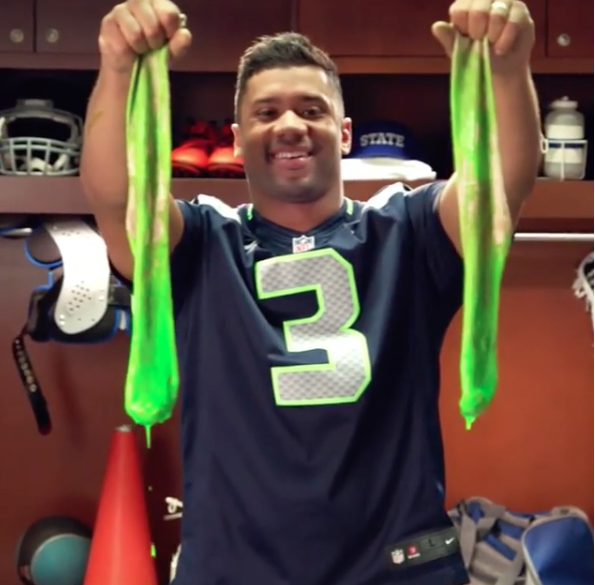 Needless to say, this year’s Kids’ Choice Sports will have an endless amount of epic moments and we can’t wait to see what Russell Wilson has in store for his third year in a row hosting the award show. Nickelodeon also announced the nominees at this year’s award show. Some of the many legendary sports stars that are nominated at the Kids’ Choice Sports include Serena Williams and Katie Ledecky, who both lead with a total of three nominations each, as well as Stephen Curry, Tom Brady, Cristiano Ronaldo, Lebron James, Simone Biles, Laurie Hernandez, and many more. Get your head in the game and vote for your favorite sports stars at http://www.nick.com/kids-choice-sports/. Don’t forget to tune in to the renowned and prestigious 2017 Nickelodeon Kids’ Choice Sports airing on Sunday, July 16th at 8:00 PM ET / PT and see if your fave athletes will be taking home a coveted, mohawked blimp of their own. Check out the full list of nominees at the 2017 Nickelodeon Kids’ Choice Sports below and comment below and tell me or tweet me at @alexisjoyvipacc, who will you be voting for to win at the 2017 Nickelodeon Kids’ Choice Sports?! Follow Nickelodeon on Twitter: @Nickelodeon and join in on the conversation by using #KidsChoiceSports on all social media networks! Previous VIPAccessEXCLUSIVE: Jacob Hopkins Interview With Alexisjoyvipaccess At The Jonathan Foundation’s Spring Fundraiser! Next VIPAccessEXCLUSIVE: Express Yourself With A Custom-Made BOLDFACE Gear Backpack – Alexisjoyvipaccess REVIEW!